All children enjoy learning through play, and never more so that when they're playing with age specific toys. Toys are always associated with kids. Have you ever wondered why? It's because play is the universal language of children. They may coo and babble as infants, then start to learn their own language during their first couple of years, yet when it comes to playing, children all around the world can relate to one another without words. What's The Purpose Of Toys? All toys serve different purposes. Babies use toys for exploring the world around them. Toddler toys are mostly designed to build up their developing minds. Preschool-to-grade-school toys help children to play at being grown-ups and help them move through the transition from being a preschool child to one that actually attends school. And so, as they grow up, their toys should grow up too. A time will come when your child will start to learn mind-stimulating games like chess, crosswords, and jigsaw puzzles. There will also be a time when they start playing sports games like basketball, tennis, and bowling. Your child's toys change as they grow, but they can still enjoy toys from younger years - and also look ahead and get a taste of the toys that will mean so much to them as they continue to grow and learn. 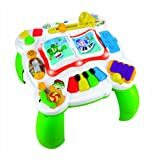 This LeapFrog Learn and Groove Musical Table supports three essential areas of sensory development taking place during infancy: touch, eyesight, and hearing, as well as the overall goal of motor development. The table's keys are very colorful and bright, to stimulate your child's eyesight and to hold their interest. The keys are also textured to appeal to your child's need to touch and feel and to help in their development. The musical features assist your child's developing sense of hearing as there are fifteen different activities and forty different songs, so your child can enjoy educational toys over and again. It's a sturdy little instrument and very easy to clean, despite all its keys and buttons, which is an aspect when choosing the best toy for your baby. It also comes with legs that you can attach when your child starts to sit and stand up. Preschoolers are known for their pretend play, and they can enjoy their games even more when you provide them with a complete set of preschool sized dress-up items for their pretend games. 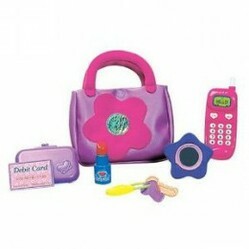 My First Purse comes with a toy cellphone, keys, wallet, mirror, lipstick and a credit card. Enjoy watching how your little girl loves to talk on the cellphone to an imaginary friend on the other end of the line, mimicking a grown-up's every move. The credit/debit card is also fun, especially when it is "swiped" between the keys of the computer keyboard. Word games never fail to entertain older children. They are fun, stimulating, and a great way to promote family bonding. Like Scrabble, the goal in Bananagrams is to form words out of your selected tiles. The game is composed of 144 letter tiles stored in a banana pouch, which makes this adult toy perfect for travel. The rules are very simple. All tiles have the same point value, and there are no boxes with special points. As a result, this is not just a great game for families but it's also a very educational game for children who are learning different words. The simplicity of the game ensures that kids won't be intimidated or confused with scoring, and so it would also be an appropriate purchase for children. Since you don't have to worry about special points for various tiles, there's no need for dawdling to calculate a score. The fast transition from player to player helps to make this game every bit as addictive as it is educational.